Face-lifted Mondeo revealed | What Car? 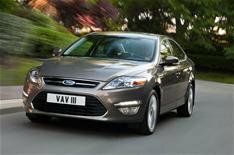 Ford has revealed the face-lifted Mondeo, which will go on sale in the UK in October. The refreshed Mondeo features an updated interior, a restyled exterior and new efficient petrol and diesel engines. The main changes to the Mondeo's exterior include a new grille, front bumpers with LED daytime running lights, plus restyled rear lights and a new bootlid. The interior has a new centre console and updated materials, while there are the options of an improved premium stereo and updated sat-nav system. The Mondeo will get a new 237bhp turbocharged petrol engine that emits 179g/km of carbon dioxide. Ford claims this Ecoboost engine provides fuel consumption and emissions reductions of up to 20% compared with a traditional petrol engine of similar capacity. There will be a revised version of Ford's 2.2-litre Duratorq diesel engine. Power has been increased by around 12% to 197bhp. Ford also says that a range of eco technologies will be available on the new Mondeo, including what it calls an Active Grille Shutter system. This electronically controlled device regulates the airflow through the radiator and engine compartment to improve aerodynamics, but also improves the engine's fuel economy and warm-up performance in cold weather. Further details on powertrains, specs and prices will be released closer to the car's UK launch.